On the way back to my boat I rowed over in the dark and asked the couple having a candle light dinner on the aft deck to speak to the captain. He appeared out of the dark. He looked like a young Jordi Mollà. I was geared up for battle but he was a professional. He was calm and kept his voice low. He knelt down on the stern platform of the big cat so we could chat out of earshot of his clients. This was a guy that was not going to be posturing for anyone. “You are concerned I am too close, yes?” he said in his silky Spanish accented English. He said he had backed down hard on the anchor and had been watching the two boats interact for several hours. He thought we would be OK. He went on to say “But of course, if you wish me to move I am obligated to do so and will make it so.” Damn, what a charming fellow. I explained that of course any damage to my boat was his responsibly and he nodded in agreement and said, “You wish me to move then?” I said “Let me get aboard my boat and make ready for sea. I leave in the morning. That will give me a chance to see how the two boats interact.” I said I’d let him know. He said he would monitor the boats all night and stand by on channel 16 if I needed to contact him. I sculled the Sweet Pea close to the cat and reached out and shook his hand. I had been completely disarmed. I got aboard the Far Reach and put fenders out, just in case, and started preparing her for a morning departure—dinghy hauled up and inverterd on her chocks. Sail cover stripped off. Blocks installed. Sheets run. Gear stowed below. We were ready to go. I slept well but checked on the two boats every couple hours all night long. It was a gusty, windy night and at times the boats got pretty damn close. Maybe 8’ apart. Every time I looked over at the Cat there seemed to be a crew member watching the two boats. Reveille was sounded at 0600. I made coffee and was underway at 0730. I used the outboard to get in close to shore. I saw Baba in the restaurant and waved then let loose with a long blast on the air horn. I slipped out between the moored boats and raised the stays’l and and engaged the self-steering windvane. I shut off and the raised the Honda to its stored position. Then, I hauled up the double reefed mains’l. The FR Reach immediately powered up. A beautiful morning. Sailing 210° true for the Narrows with a double reefed main and stays’l. Since I was a kid first learning to sail I have enjoyed that sudden surge of power when a sailboat harnesses the wind and heels under your feet. I took up a heading of 210° True. The breeze was climbing up to 20-25 Kts. I was in no hurry. So, I took it easy and just lollygagged under reduced sail. Maybe 5-5.5 Knts. The Cape Horn windvane was holding a proper course. I enjoyed another cup of coffee and just took in the grandeur of sailing among these beautiful islands. We reached past Thatch Island and into The Narrows then into the Windward Passage between St John and Lovango Cay. We sailed SSE past St John. I disengaged the vane and hand-steered as the wind was very shifty due to the mountains and hills of St John. As much as I wanted to, I decided not to take the short cut through the “Cut” on the west side of James Island…I would lose my wind and I was not sure which way the current was running. There was also a lot of high speed ferry boat traffic running through the narrow cut. This is the kind of decision a prudent skipper has to make…and not everyone does. Yes, I have the outboard. Yes, it’s reliable. But a number of things could go wrong in that cut: I would definitely lose the wind behind James Island; because I was reefed down there would be a corresponding loss of horsepower in terms of sail area; the current could be against me and without local knowledge I didn’t know for sure which way it ran; I could have a four foot wall of water caused by a passing ferry flood the outboard just as I passed through, which might swap it…the list goes on. 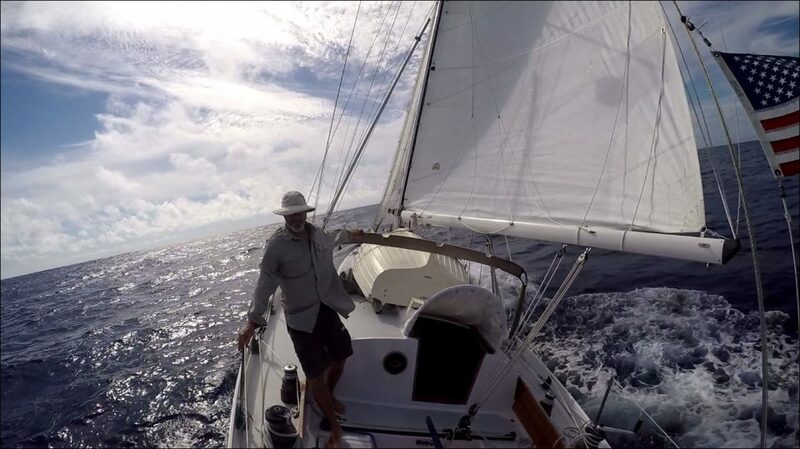 A good skipper is constantly calculating speed, available power (be it sail or engine), the nearby terrain and hydrography, and ability to maneuver against all the stuff that can go wrong and suddenly limit your freedom of action. Sailors get into trouble when they don’t pay attention to what they are doing or ignore the alarm bells going off in their head. Under the circumstances, it was an easy decision…we were going the long way. So, I sheeted in to a close reach and sailed just to the west of Stevens Cay near Cruz Bay and continued out into the Atlantic. I felt reassured by the ocean swells rolling under my feet and which the Far Reach handles so easily. The longer route added 90 min to the trip. Once clear, I turned west past Dog Island leaving the “Frenchman’s Hat” to port. Just before we turned west. That’s Dog island to the right. Off to the left side of the photo, above the winch handle you can see the Frenchman’s Hat. We sailed between them. We had an easy run down the coast of St Thomas in 20-25 kt easterly. I should have set up the whisker pole to sail wing-and-wing but I decided instead to have another cup of coffee and finish off Carmen’s Banana bread. Soon, we were adjacent to the entrance to Charlotte Amalie. That’s a Carnival cruise ship in Charlotte Amalie. We did not enter there. We sailed past that entrance and sailed up the East Gregerie Channel to Elephant Bay. We sailed on past then close reached up the East Gregerie Channel then gybed near French Cut and ran down West Gregerie Channel. I dropped sail and transitioned to the little Honda 9.9 hp outboard. I eased the anchor down to the bobstay and made sure the foredeck was clear for handling the ground tackle. We passed through the anchorage a couple times with the little Honda powering us along. I swung the sounding line to gain knowledge of the depth and determine where best to anchor. I selected a spot and coasted up with the engine in neutral. Just as we lost way I eased the anchor down till I felt it hit bottom. Then, I payed out the chain as we drifted back in the 25 knot wind. I snubbed a few times. I felt the anchor dig in. I payed out more chain. I reversed the outboard and powered up watching a nearby boat as a reference to ensure we would not drag. I let out 100’ of chain. We were securely anchored in 14’ of water on a grassy bottom on the west side of Water Island opposite Crown Bay Marina. I donned my mask and fins and dove down to check the anchor and see if there was any junk on bottom that might interfere with the chain. All clear. Anchored in Elephant Bay on the west side of Water Island. Crown Bay Marina is to the NE of our position. The big harbor of Charlotte Amalie is through the narrow cut, known as French Cut, at the top right of the chart. I climbed back aboard and rinsed off. I launched the Sweet Pea and rowed ashore. Took the Safari (the dollar cab the locals use) to customs and cleared-in without issue. I stopped at Tickles Pub on the way back and reconnected with several old friends and made some new friends. Breathe…life is good. Anchored off the west side of Water Island.